In Mexico, factory workers who typically make an average of $2.40 an hour down from $3.20 an hour in December 2018, are angry for being paid poverty wages. Workers are also expressing anger towards labor unions which are often controlled by the government or prominent business leaders. With President Andrés Manuel López Obrador, Mexico is experiencing changes in labor relations. The trigger for recent strikes began from President Obrador’s decision to double the minimum wage to 176.72 pesos (U$ 9.28) a day beginning from the start of 2019. The 16 percent increase raised the wage floor to 0.60 cents an hour. This wage, while still very low keeps up with the cost of feeding a family of four, ensuring people do not starve to death. The new policy created a separate minimum wage of $1.10 per hour for people working in factories in border regions. Here, nearly two million people work in factories owned by multinational corporations. 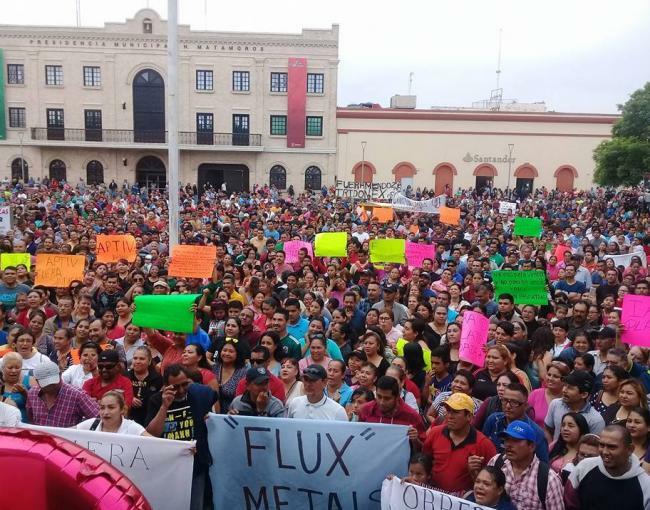 The strikes in Matamoros came as factory workers were already earning around $2.50 an hour, meaning they did not benefit from the new wage hike. The workers in Matamoros insisted they should also be getting raises. In addition, many of their labor contracts stipulated raises and bonuses based on alterations of the minimum wage. Due to the minimum wage doubling, their wages should also have doubled to $5.00 per hour. The factories in Matamoros said a wage hike was too much. On January 1, 30,000 workers went on strike. Strikes in Mexico came as a shock to business groups and employers. The Mexican government has long quashed labor strikes by jailing workers who go on strikes. These actions exhibit why Mexico is home to some of the lowest wage rates in the developed world- this has been further encouraged by US companies. By February 9, 45 factories agreed to the demands in Matamoros, sparking a new movement known as the 20/32 Movement. The 20/32 Movement is based on the 20 percent pay raise and annual 32,000 peso bonus that factory workers in Matamoros demanded. As of last Thursday, hundreds of workers at Coca-Cola have been on strike for over two months demanding the same 20/32 raise. Many have camped outside of the facility bringing production to a near halt. The company is one of the few employers in the state of Tamaulipas that has not agreed to workers.